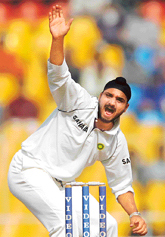 As the Indians ran away with an emphatic 2-0 over the hapless Sri Lankans at Ahmedabad, one person who would have been licking his fingers, both literally and figuratively, during the prize-giving ceremony would be a tall young man from Jalandhar who answers to the name of Harbhajan Singh. There’s nothing like a bit of ordinariness to give an extraordinary spin to life. The lanes are dusty and rutted and the locality (Daulatpuri in the heart of Jalandhar) is that typical not-so-posh area where aspirations take root without any glamorous innings.